Did the BJP alienate Jats? What is the way out for the party? The Jat stir that has taken heavy toll in terms of human life, economy and the social fabric in Haryana. As the state begins limping back towards normalcy, politics over the Jat quota issue has begun. There was a whispering campaign going on right from the beginning that parties with a strong base among Jats were encouraging the agitators. Now an audio clip of Prof. Birender, a former aide of ex-chief minister Bhupinder Singh Hooda, purportedly instigating protesters, has added fuel to fire. While Birender has reportedly said that the clip was doctored and the conversation with a Khap leader Kaptan Mann was an old one, Haryana Pradesh Congress Committee president Ashok Tanwar has asked him to explain. Both the Congress and the Indian National Lok Dal (INLD) have been saying that they have nothing to do with the arsonists and have constantly been appealing for peace. Haryana's parliamentary affairs minister Ram Bilas Sharma has said that the government will get the audio clip investigated. Congress sources claim that even the notice issued by Tanwar is a preemptive move as Birender was never a member of the party. "Even if he is found to be guilty, he would be to blame and not the party," said party spokesperson Krishnamurti Hooda. The Congress has said that the Manohar Lal Khattar government is trying to pin the blame of its failures on others. "The government has failed in all its responsibilities. Haryana was left at God's mercy for 3 days. While the ministers kept away, even the police turned its back on the people. It was the inefficiency and inexperience of the government that made the situation deteriorate to such an extent," said Hooda. The INLD has targeted both the state government and the Congress over the issue. 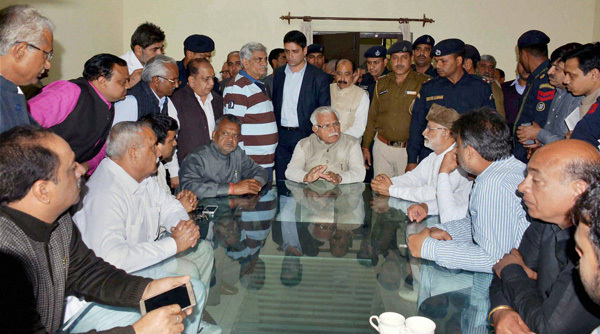 A party delegation met the Haryana Governor Kaptan Singh Solanki seeking the dismissal of the Khattar government and imposition of President's Rule in the state. Party leader Abhay Singh Chautala accused the BJP of fishing in troubled waters saying that party MP Raj Kumar Saini was giving anti-Jat statements and instigating members of other communities. He said that the government has pushed the state to a civil war like situation, in which castes are pitted against each other. Chautala, who is the leader of the Opposition in the state assembly, also hit out at the Congress saying that the audio clip of Birender shows how attempts were made to instigate peaceful agitators. While calling for an investigation into the clip, he said that this also shows that the government was tapping phones illegally. It needs to be pointed that both the Congress and the INLD have a strong base in the Jat dominated heartland of the state. Jats constitute around 26% of the electorate and are elected on around 30 of the 90 seats in Haryana. Although the BJP had managed to win a majority in the last assembly polls, winning 47 seats, it could not break the Jat citadels, which largely remained with the INLD and the Congress. Observers say the non-Jat voters, who were tired of Jat dominance in state politics, consolidated behind the BJP and helped the party win in the Assembly elections. To top it all, the party made Khattar, a Punjabi Khatri, the chief minister. This singed the Jats and this anger has come out in the recent agitation. He was heckled and shown black flags when he visited Rohtak on Tuesday. The houses of 2 senior Jat ministers Captain Abhimanyu and Om Prakash Dhankar were targeted by violent mobs during the agitation. 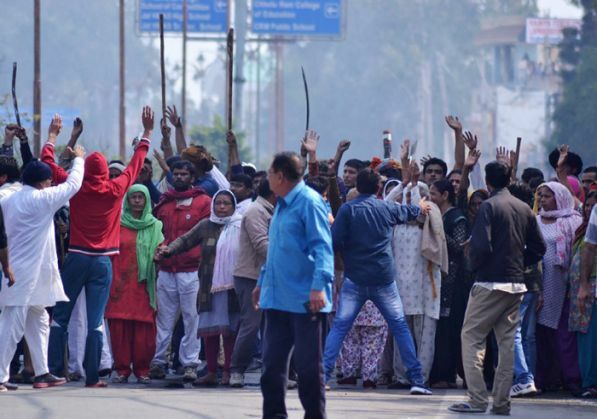 The government's decision to bring a Bill in the next Assembly session providing reservation to Jats, is not likely to go down well with its non-Jat base. The latter would naturally feel that the Jats successfully arm-twisted the government through a violent agitation. Even the state Cabinet appears split on the issue. Health minister Anil Vij is reportedly annoyed with Khattar for announcing a compensation of Rs 10 lakh and a job for the kin of those killed in firing by security forces. Vij was reportedly of the view that those indulging in violence should not be compensated. Like Khattar, Vij is also a Punjabi Khatri. On the other hand the Congress and the INLD have now started hitting out at the BJP by questioning Prime Minister Narendra Modi's silence. "He comments on everything, why was he quiet when Haryana was burning?" said Congress spokesperson Krishnamurti Hooda. "Modi calls Haryana his second home. 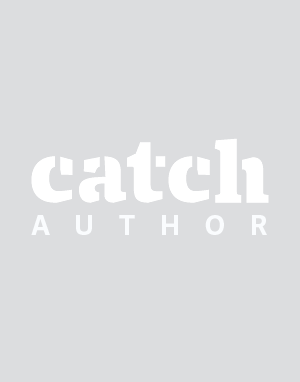 Now when his second home is burning, isn't it his responsibility to fulfill his promises?" Chautala asked. According to the state government, 16 persons lost their lives over the last 4 days and 183 were injured. 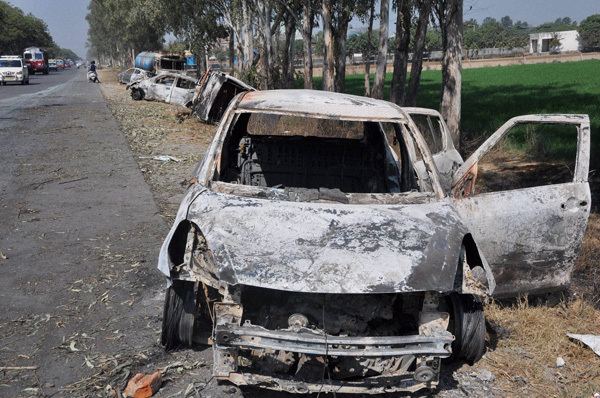 Haryana Roadways suffered a loss of Rs 15 crore as 33 buses were set afire and 99 were damaged. Out of 2,370 petrol pumps in the state, 381 became dry and out of 387 LPG agencies, 185 are without their stock. The arsonists damaged 26 petrol pumps during the agitation. The reported economic losses are pegged at Rs 34,000 crore.